While this speaks to matters between individuals, we think that it also shows a just way for a community organization to act. With that in mind, here is a timeline that might be helpful. - On February 27th, we sent a letter to Mr. Lamb, copying Sister Barbara Hahl and several others, including Bishop Campbell. We did not get any response. - On March 14th, we sent another letter to the same individuals. This one was signed by a dozen pro-life and faith leaders from the region and state. In addition, several organizations made direct outreach of their own. - On March 16th, we received a phone call from an administrative staff member that the letters had been received and that they were working on a response "within the week." - On March 29th, Still having heard nothing, we placed a phone call to the administrative staff member to ask for an update and also to convey that the physicians in question had lost their credentials at another local hospital. This was important because the abortion facility that women are being referred to does not meet the normal standard under Ohio law, so they operate under a variance that requires the doctors to have admitting privileges at a hospital so that if there is an emergency they can admit their patients to that hospital. Having lost privileges at other hospitals, Mt. Carmel is now the named entity that permits these physicians to perform abortions. This calls into question if Mt. Carmel is directly facilitating abortions by their inaction. On that phone call, we were told that there was going to be a meeting on this issue on April 2nd and we would hear back. - On April 6th, we launched this petition site, and we will keep it up until we have gotten a response from Mt. Carmel that shows they have taken the appropriate action. - This is not the first time that this has happened. In 2013, a similar situation happened with Mt. Carmel (albeit under a different president). In that instance, it was not until we started a similar petition drive that action was taken. Here is a Copy of the Letter/Form from 2013. As members of the local pro-life community, we appreciate the vision of Mt. Carmel to "become a leader in improving the health of our communities and each person we serve. We will be the most trusted partner for life" (emphasis added). Thus, we are incredibly concerned that Mt. 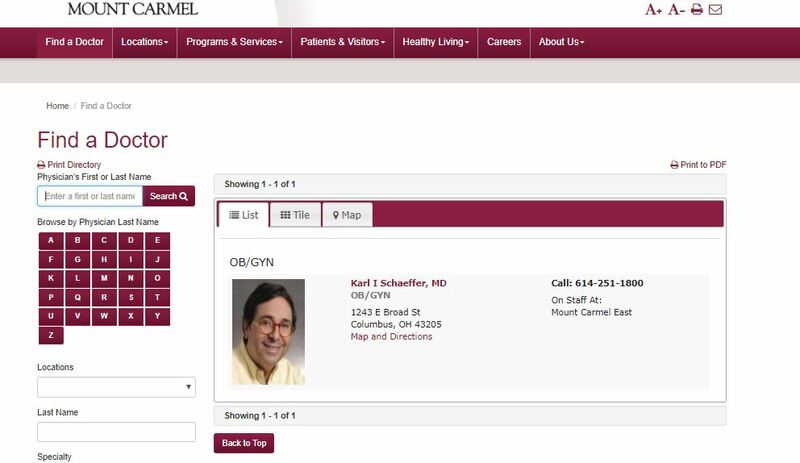 Carmel Hospital is actively referring women to an abortion clinic via your online physician directory listings for Dr. Harley Blank and Dr. Karl Schaeffer. This is an issue that we, as members of the pro-life faithful, take very seriously, and we ask that you take immediate action to remove the referrals from your website. Furthermore, according to your staff bylaws, staff members are on notice that they are expected to "abide by generally recognized standards of medical and professional ethics including, but not limited to, the Ethical and Religious Directives for Catholic Healthcare" (3.9.5). They are also required to maintain various professional and service standards that include maintaining malpractice insurance (3.7.1). We respectfully join the requests of Greater Columbus Right to Life that date back to 2013 that you review each physician who has privileges or a staff position at the hospital to make sure that this standard is met. We implore you to live up to the standards of your own mission as well as the Ethical and Religious Directives for Catholic Healthcare in name and in action. This information will be shared publicly. Offensive or obviously false information will be voided. We will only share your city and state on the letter. Your email address will not be publicly visible or shared. It will be used to confirm that signatories are real. This information will be used for statistical purposes in aggregate. We are asking this question because Mt. Carmel is a Catholic Hospital, and sometimes organizations pay extra attention to their constituencies. This information will be used for statistical purposes, in aggregate. This information will be attached to the letter. Any comments that are not consistent with GCRTL's Statement of Peace, Belief, and mission will not be included. protects innocent human life from conception until natural death.